If you’re looking for the bible on how to treat your body during pregnancy, look no further. 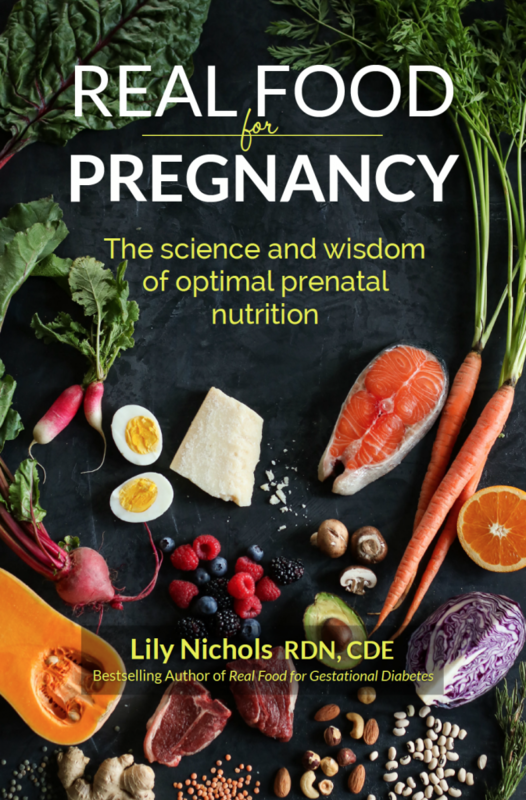 Lily Nichols, RDN, CDE, has written a well-researched compendium of advice, tips, and information on what we eat and do in pregnancy. Experts recommend a whole-foods diet high in protein, calcium, iron, folate, and other nutrients in pregnancy. Nichols tells us the details, the research, and why and how to get those nutrients. For example, most of us know we need increased protein intake during gestation. What few families and few providers know are the specifics of this physiological requirement. Nichols walks us through all of it. One fascinating aspect of the protein rule is her discussion of certain amino acids that are more crucial in pregnancy than they are otherwise. One of these is called glycine. Glycine is indicated in the formation of your baby’s DNA, organs, blood vessels, skin, and joints. It is essential in keeping your uterus and placenta growing and healthy as well as supporting your stretching skin. Normally your body can make enough from the foods you already eat, but during pregnancy you need more than your body can make. Some research suggests that problems we normally associate with inadequate protein intake are actually symptoms of inadequate glycine. Gelatin and collagen are the two richest sources of glycine. You can get it from bone broth, slow-cooked tough meat like pot roast or pulled pork, poultry with the bones still in, sausage, bacon and ground meat (usually made with tougher cuts). You can also add pure gelatin powder or collagen powder to other food. 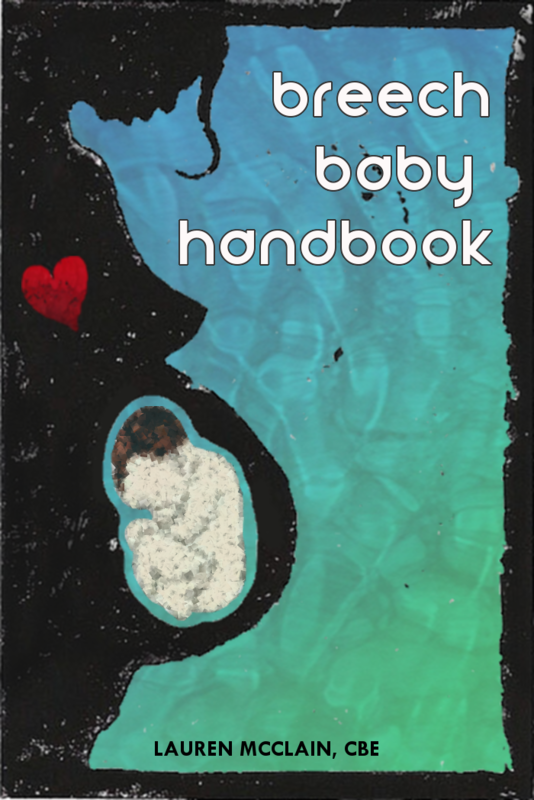 In Nichol’s book you will find more details about the recommendations for pregnancy and the latest research–or lack thereof–concerning common dos and don’ts. I’m fond of her list of healthy snack ideas. There’s plenty here to just take away without having to go through the whole book, including how to resolve common pregnancy complaints with food, moderate your stress levels, and avoid toxins. She encourages lab tests in early pregnancy to test for nutrient levels. Are you actually getting enough vitamin D or magnesium? Another great aspect is the postpartum and breastfeeding section. 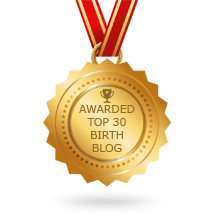 So often what to do and how you can make postpartum easier is overlooked. I like this book because of how well-researched and specific it is. I like to know the specifics of why I am doing something, not just that I should. If that’s you, too, you will find that here. It can be overwhelming to know all this information about optimal living and eating. You just do your best. If you tend toward anxiety on these topics, please read any advice with that in mind. Anytime you feel yourself following a recommendation out of fear, stop and take a breath. You can’t follow all the recommendations and avoid all the stressors. Unless you live on an isolated, self-sufficient organic farm and you don’t much like food, it’s impossible to do everything. If it raises your anxiety to think about all the things you should be doing or ways you’re potentially harming your baby, take a step back. The anxiety and compulsion to control are not healthy or fun for either of you. Eat the best, most wholesome food you can stomach and afford. This is a great time to start good habits for yourself. If you’re ever going to buy and eat organic or more wholesome food, do it now. But you can’t control everything and the benefits to you and baby don’t outweigh making yourself miserable or broke. Get Real Food for Pregnancy here. 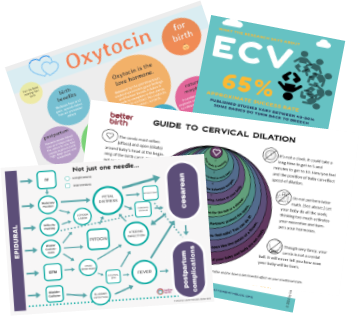 For a comparably very simple handout on how to eat and be nourished in pregnancy, check out Better Birth Graphics.